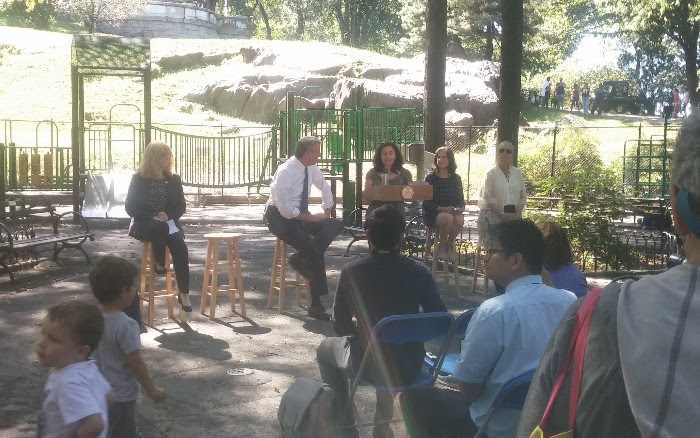 De Blasio Adds Rat Funding For Our Neighborhood: News conference at the Hippo Playground Project in Riverside Park at 91st Street. Left to right: Assembly Member Linda Rosenthal; Mayor de Blasio; Hippo Playground Spring Chair Tali Etra (speaking); Council Member Helen Rosenthal; Manhattan Borough President Gale Brewer, announcing anti-rat funding. Saying that the City “has listened” to the complaints of parents and community groups, Mayor de Blasio dedicated $750,000 to a pilot program of new rat-proof, high capacity, solar-powered compactor garbage receptacles personnel that address the community’s rat infestation. The budgeted “big-bellied” compactor/receptacles cost is $3,500 each. In the Sept. 25 issue of the N90s newsletter, we were critical of the de Blasio administration for foregoing the Upper West Side completely for other neighborhoods, the Lower East Side, Grand Concourse, Bedford-Stuyvesant and Bushwick, that got $32M in rat abatement funding back in July. While rats are blamed for spreading pandemic plagues in Europe starting in the 1300s, more recent concerns include “preventing diseases such as leptospirosis, a bacterial infection,” a serious disease spread through rat urine that affects pets and humans, according to the New York Times. “Targeted” facilities getting rat-proof garbage receptacles and Parks Department boots on the ground in our neighborhood include: Joan of Arc, Hippo Playground, and PS 75-Emily Dickinson School. Playground parents were among the most vocal, since this summer’s playground experience included rats alongside their children in sand boxes and baby carriages. Hippo Playground Project’s Tali Giladi Etra noted that the sight this summer of a hawk holding a rat in its talons while sitting in the playground was quite upsetting. Because parents and toddlers leave food behind in playgrounds, rats have proliferated in our local parks. Community Board 7 Manager Penny Ryan reports that since the installation of these compactors, the number of rat nests in Theodore Roosevelt Park is down to nine, from a peak of 100, which could explain the Mayor’s sunny prediction of a 90% rat reduction on the UWS. More likely, only the neighborhood’s 12 targeted areas will successfully reduce rat nests. The “Targeted Rat Program” includes a few more staffers as well as additional late-in-the-day shifts for Parks Dept. workers who can clean up food refuse after people create the garbage rats feed upon, and disrupt and discourage the rodents’ normal feeding rhythms. Parks and Recreation workers’ shifts commonly begin early and end at 3:30 PM. The City’s nocturnal Norwegian rats rarely emerge from their burrows before sundown. The program is starting with playgrounds and schools because they have become breeding grounds for rats. The playground because so much food is left behind, and it attracts rats. The schools are problematic because of the food waste generated by the cafeterias. Rats may like surprise meat loaf more than kids. The Mayor was surrounded by more than a dozen aides from the Health and Parks Department, flanked by the two Rosenthals (Helen of the City Council; Linda, the State Assembly Member), Borough President Gale Brewer and activists from the Hippo Playground. C.M. Rosenthal reports is a beginning, with the City intends to bring such advanced technology to fight rats as dry ice (suffocates them in their nests without exposing hawks and pets to rodenticide) and birth control. Bottom line: Last Monday, we called out the Mayor for bypassing the Upper West Side on rat extermination funding. When the week began, our entire community had plans from the Health Department (DOHMH) to exterminate rats, but $0 to do it. Now, thanks to Helen Rosenthal, we have $750,000 for a “target” program. When making his $32 million announcement this past July, the Mayor is quoted saying that the City will wipe out “70%” of rat population in the neighborhoods where he was providing funds. https://www.nytimes.com/2017/07/12/nyregion/new-york-city-rat-problem.html. While the Mayor has promised to wipe out “90%” of rats on the Upper West Side, we have a very long way to go and need a much larger funding commitment to get there. And it will take work from parents, porters, supers, etc. over an extended period to make effective inroads. 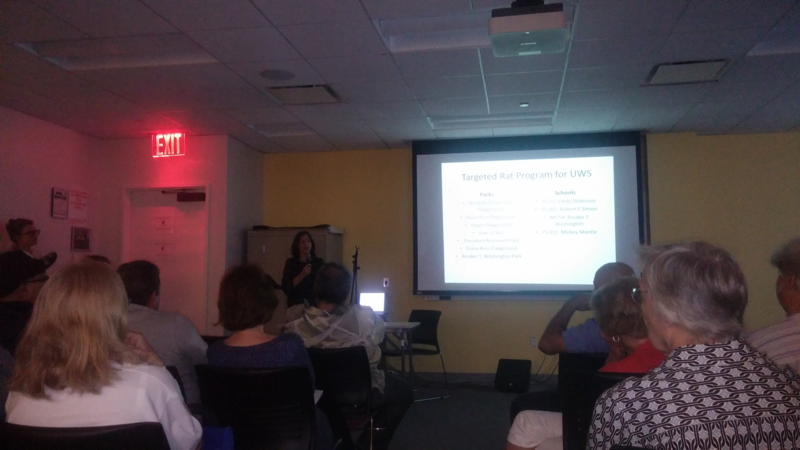 For the past year, Neighborhood In The Nineties, among other neighborhood advocates across the Upper West Side campaigned to get the Department of Health/Mental Health (DOHMH) to hold its instructional rat prevention class known as the Rat Academy. City Council Member Helen Rosenthal (seen above addressing Rat Academy) was on hand to underscore how seriously the City government is taking New York’s rat infestation. While the course was very thorough, tenants, co-op shareholders, block association leaders and superintendents raised many questions, ranging from the right kind of garbage bag (here’s a hint: forget about lining them with mint), to the City’s enforcement program and what to do with indiscriminate bird feeders who are providing rat food. The average rat weighs one pound. They are not cat-sized! What are signs of rat activity? Building residents must put trash in cans, and close them! Due to space limitations, we cannot cover the entire Rat Academy curriculum. Please go online for more information about eliminating rat burrows in and around your building, and safe and effective uses of bait stations. To learn more about these items, and to see a complete rundown on rat prevention in your building, please visit the City’s Health Department site at: http://www1.nyc.gov/site/doh/data/health-tools/rats-how-to-inspect-prevent-respond.page. The next Neighborhood In The Nineties newsletter will cover, among other things, responding to quality of life issues posed by homeless people in our neighborhood. If you are a neighbor, you may subscribe to our newsletter by writing to info@N90s.org or visiting us at www.N90s.org, and signing up. Founded in 1971, Neighborhood In The Nineties, Inc. is one of the City’s oldest neighborhood associations, advocating for public safety, quality of life and a fair share of municipal services. We serve the area between Riverside and Amsterdam Avenues, 90th to 98th Streets on Manhattan’s Upper West Side.